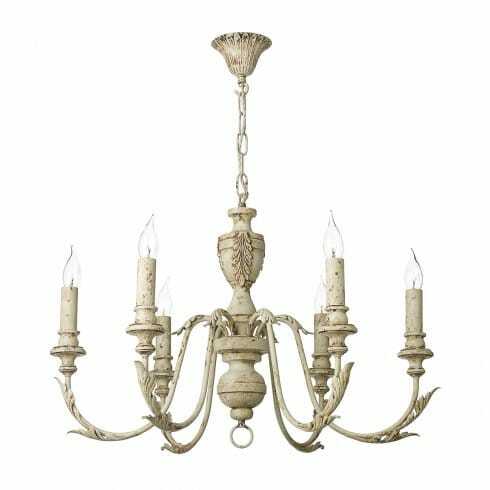 David Hunt Lighting Emile 6 light ceiling pendant features a decorative ceiling plate with chain holding a chandelier style 6 light fitting with scrolling arms and decorative leaf metalwork all in rustic french finish holding decorative bent tip candle lamps. The product code for this David Hunt ceiling pendant is EMI0655. This British made design has a french chic country style and the rustic french cream finish adds a vintage twist which will sit perfectly in both the modern or contemporary settings and classic or traditional settings alike. Height adjustable at point of installation and comes supplied with an extra 50cm of cable with additional chain available on request. The Emile range also includes a matching 12 or 6 light ceiling pendant and a 2 light wall fitting in Marston & Langinger mole brown finish and a 12 light ceiling pendant and a 2 light wall fitting in rustic french finish all of which can be ordered on our website.